When I was struggling with my self-worth–like when it was really, really bad–I was grasping for anything around me to bring me happiness. I had worked for 2 years to lose 80 pounds. I had 2 healthy kids and a husband who loved me, yet I couldn’t find anything to bring me true happiness. It was as if I was in a tornado of emotions. I knew I should be happy and joyful because I was so blessed, but when I woke up in the morning, I felt anxious and depressed. If family issues were discussed or something wrong or difficult was brought up, I couldn’t handle it emotionally. I wasn’t willing to work through emotions or difficult things. I was confused, and I felt so alone. 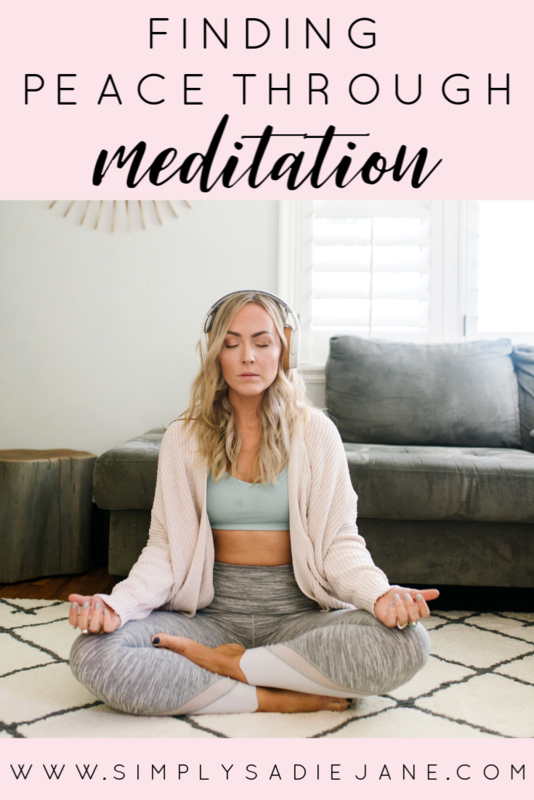 In one of my very first yoga classes, there was a moment after a really difficult physical portion of class when the teacher had us sit in stillness. He talked about meditation and what that actually was. Up until that point in my life, I think the only times I sat in stillness were to say a prayer or fall asleep. It was beyond difficult. I couldn’t understand why it was so hard for me to sit with my thoughts. Or just sit and not move. To see one thought at a time and allow it to go away and focus back on my breath or the music. It was dumb. I didn’t have time for stillness. What was the point? Even with my negativity, with each yoga class, I committed to meditation. I think it was my competitive side. I didn’t want to disappoint the teacher and be the only one in class that moved. Each time something different would happen, things would shift, and my mind would start communicating with me. It was scary. Talk about vulnerability on another level. I wasn’t able to run away from the past or my thoughts. And yet instead of running, sitting with the thoughts and trusting myself to allow those memories to release was easily the most therapeutic thing I’ve ever done. For the first 3-6 months, I think I just cried and let the tears fall during the entire 3- , 5-, or 15-minute meditation…but over time, evolution happened. Your stillness changes you! It changes everything you’ve known! It was finally possible to talk with myself. To finally say, “I see you, Sadie! I see you, and I know you have the courage to see yourself, to see that you have everything within you! Already! Right now. You can do this. You can fight.” I pushed through my depression, anxiety, childhood memories, even my body dysmorphia disorder. It’s possible, and important, and I promise if you put in the work (because meditation is some of the hardest mental work you will do), you will see your life begin to change.